A true 5” from the down-pipe back, the new ATLAS exhaust is engineered to perform in the most extreme environments. This system is constructed from mandrel bent 5” aluminized steel tubing for maximum flow, increased horsepower, increased torque and lower EGT’s. 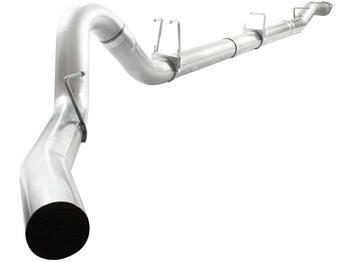 This system is available in 5” down-pipe back without muffler. ATLAS exhaust systems are the perfect combination of performance, fit and value. ATLAS exhaust systems utilize a 2-piece tailpipe design for a perfect fit by allowing adjustability at the tailpipe section. All systems use factory mounting locations providing stability and hassle-free installation. A muffler delete-pipe is used for a true race-inspired sound and maximum flow. ATLAS exhaust systems are constructed of 4” or 5” mandrel bent aluminized steel tubing for maximum flow. Smooth transition bends allow for low turbulence, increasing horsepower, torque and lowering EGT’s. Note: This is a “Race Only” product used solely for competition. Its use is limited to closed-course and open-course racing that is formally sanctioned by a recognized racing organization. Any other use including recreational off-road use could be in violation of local, state and federal laws.